[spacer height=”20px”]Thirty-eight years ago at this time, a reporter from the Chicago Tribune, Mr. Brian Downes, was looking forward to an upcoming interview with someone he had admired since he was a young boy. 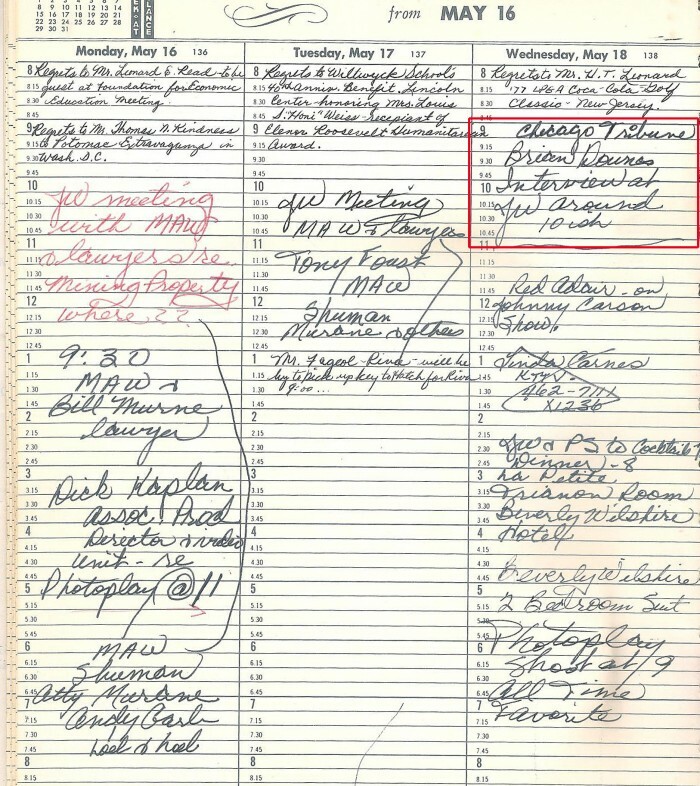 This is the page from John Wayne’s planner, now on display at the new John Wayne Birthplace Museum, documenting that special visit. 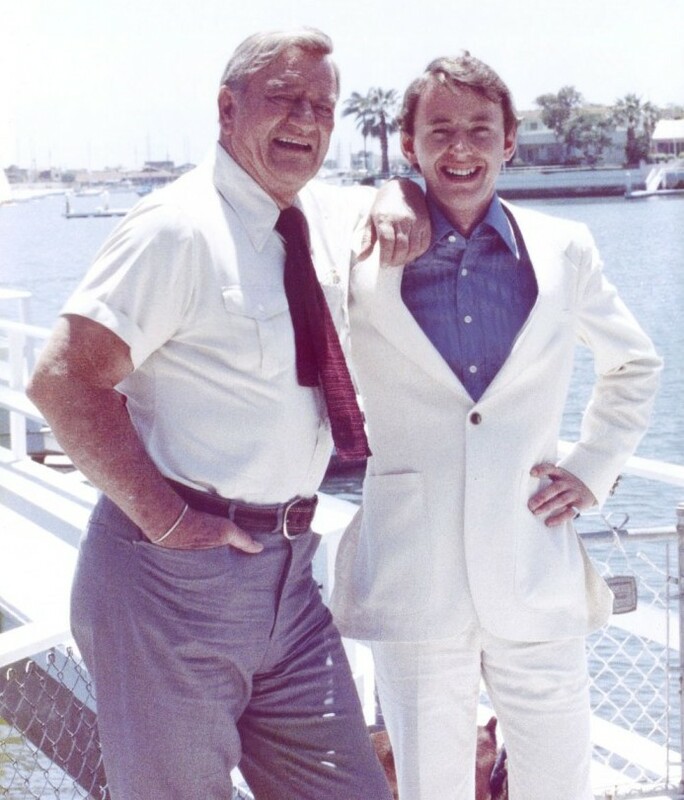 Wayne Davis of TYPExpress and the John Wayne Birthplace board of directors shared the photo of this artifact with me, as well as this photo of Brian Downes with the Duke at the time of the interview. “Is it okay with Brian if I share this photo?” I asked Wayne when he sent it to me a few days ago. I love that look of sheer delight on his young face, having absolutely no idea that 38 years later, this photo would be shared on the website (what’s a website?) 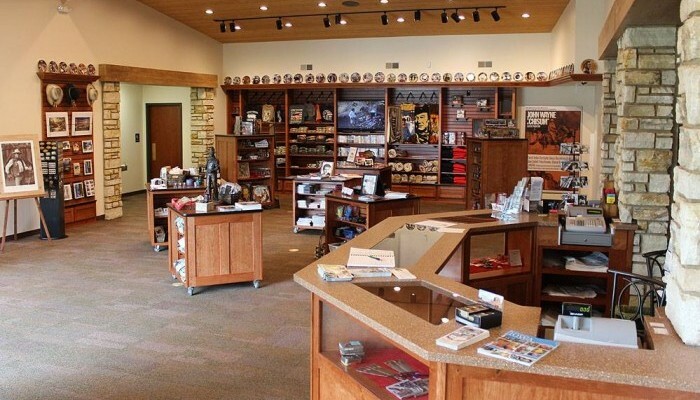 of the John Wayne Birthplace Museum, of which he was the Executive Director, and he would be busy taking care of last minute details for the grand opening celebration weekend planned for May 22-25, 2015. 1:00 p.m. Free John Wayne movie (“Chisum“) at the Iowa Theater. 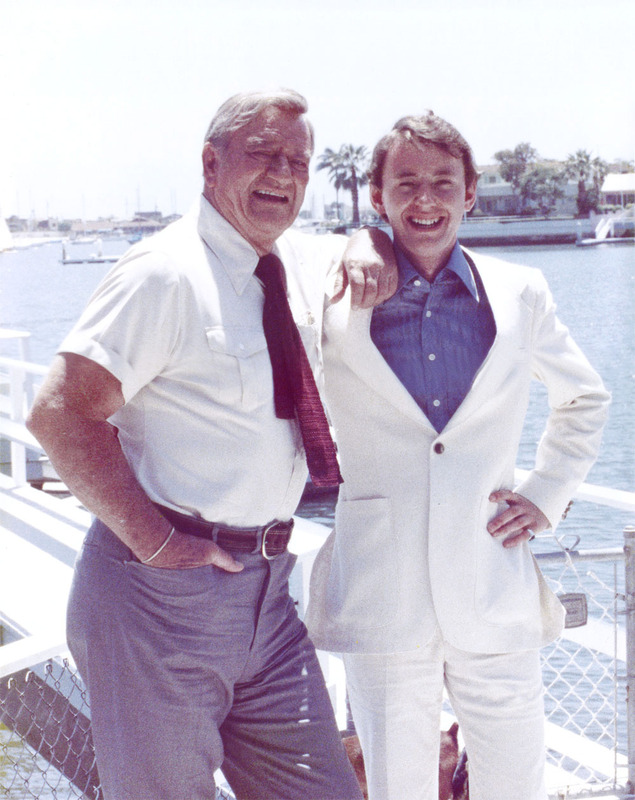 In honor of one of several special guests we’ll be receiving in town this weekend, actor Christopher Mitchum, they’ll be showing the three films in which he starred with the Duke: Chisum on Friday, Big Jake on Saturday, and Rio Lobo on Sunday. 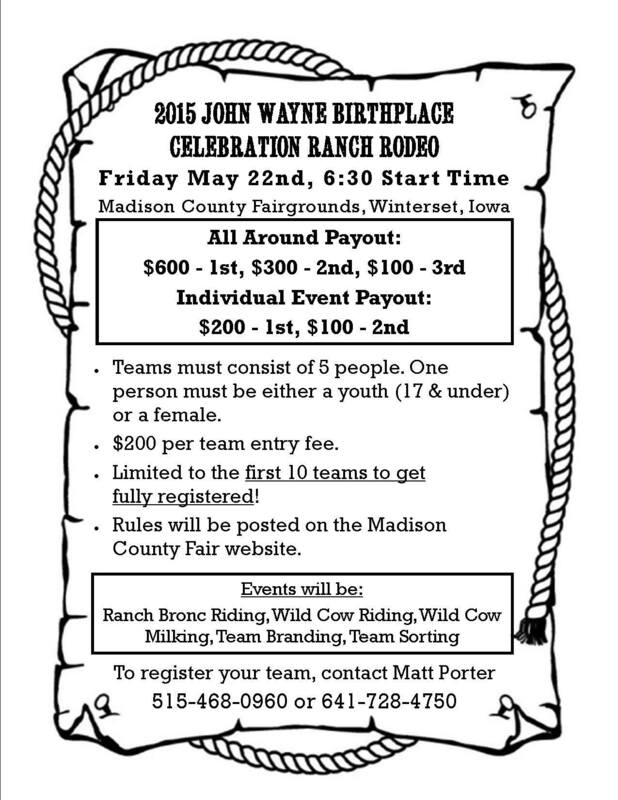 6:30 p.m. Ranch Rodeo at the Madison County Fairgrounds. Tickets for the Rodeo and Dance (at 9:00) are $20 for adults and $10 for children under 12. Preschool and younger are free. Advance tickets ($15 for adults and $8 for children) are available at the Madison County Chamber of Commerce. 7:00 to 11:00 a.m. Fireman’s Pancake Breakfast at the Fire Station. Just $6 per person will provide you with all you care to eat; pancakes, scrambled eggs, sausage, milk, orange juice and coffee. 9:00 a.m. John Wayne Birthplace 5K Run/Walk, starting in John Wayne Birthplace Museum Plaza (corner of Washington St. and John Wayne Drive). 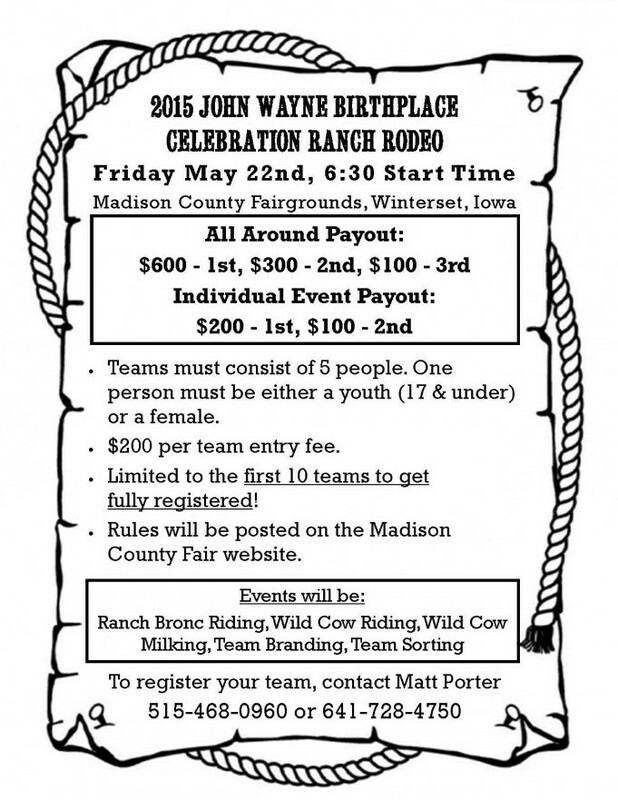 For more information, contact Robert Kaldenberg at (515) 462-4731 or at rakaldenberg@gmail.com. Online registration is available at this link. 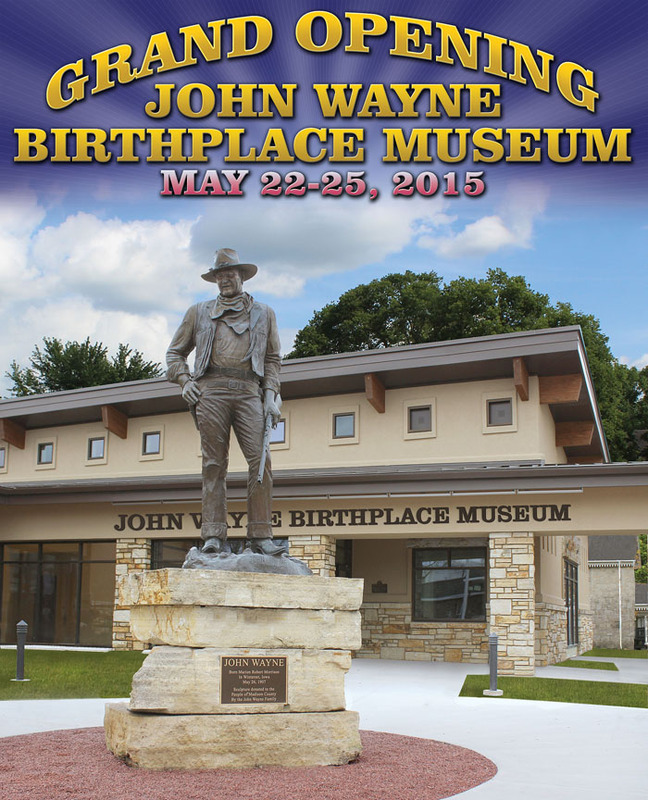 9:00 to 11:00 a.m. John Wayne Museum and Birthplace Tours — Reservations Required. Due to the anticipated popularity of tours over the Museum Grand Opening weekend, you’ll need to get tickets for a specific time slot over the three days of the Celebration. Each ticket is a combination tour of both the Birthplace house and the new Museum. You will be able to visit both locations as you wish within your time slot. Tickets are limited and are available on a first come, first served basis. Reserve your tickets below or by calling us toll-free at (877) 462-1044. 11:00 a.m. Iowa Military Veterans Band Concert, by the John Wayne Birthplace Museum Plaza. This prestigious band includes local musicians Dave Trask and Chris Nolte. They will be setting up across from the plaza in the parking lot of the former American State Bank building for their concert before the ribbon cutting. 12:00 p.m. John Wayne Birthplace Museum Ribbon Cutting, at John Wayne Birthplace Museum Plaza. Scott Eyeman, the New York Times bestselling author of John Wayne, The Life and Legend, will be the keynote speaker at this event, and there will be other celebrities and dignitaries present. 12:00 p.m. Cowboy Mounted Shooters, Madison County Fairgrounds. Mounted contestants compete in this action timed event using two .45 caliber single action revolvers, each loaded with five rounds of specially prepared blank ammunition following courses of fire set in a variety of patterns. It’s fascinating to watch as the riders (mostly in traditional western style or the old time style of the late 1800s) race their steeds through the course to get the fastest time and the highest scores! 5:00 p.m. John Wayne Birthplace Museum Benefit Dinner, behind Agriland FS Building (corner of 10th St. & Buchanan). This event will include dinner by Jethro’s BBQ from 5:00 to 7:00, welcoming speeches, an auction of unique John Wayne collectibles (including artwork and film wardrobe), and a concert by Marty Stuart & His Fabulous Superlatives. 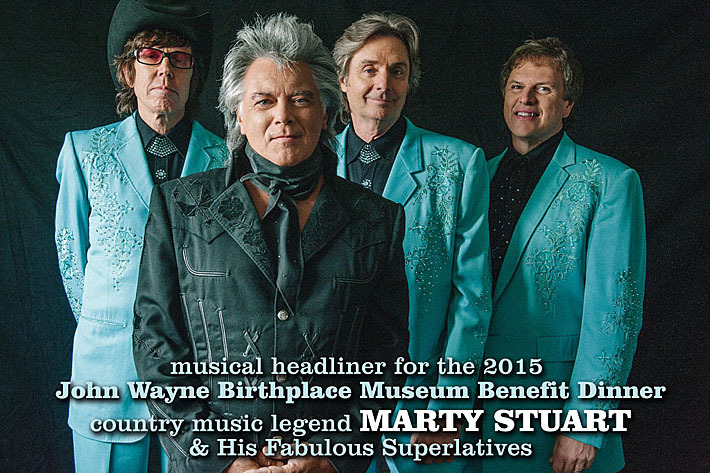 Call 877-462-1044 for ticket information, or check the John Wayne Birthplace Museum site for online ticket sales. And of course, that’s not all. Actor Barry Corbin will be in town, rodeo royalty Hannah Hilsabeck (Miss Rodeo Iowa) and Jessica Hanrahan (Iowa Horse Fair Senior Cowgirl Queen) will be available for greetings and photos, and lots of homes and businesses are gearing up with their own plans to celebrate the weekend. Be sure to check the John Wayne Birthplace Museum Website for full details, and Like their Facebook page for up-to-the minute information. It’s sure to go down as one of the community’s most memorable events. If you’d like to get ahead of the crowds, the new museum is now open and available to tour. The 6,100 square foot facility houses an astounding collection of memorabilia from John Wayne’s life and motion picture career. 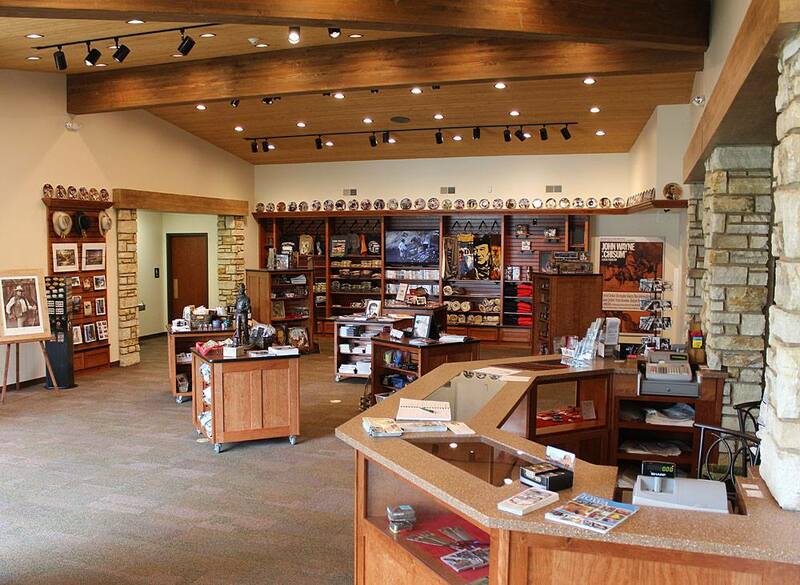 It also features a movie theater (with seats from Grauman’s Chinese Theater in Hollywood) showing a documentary on the Duke, and this spacious lobby area, where guests can view a wide assortment of John Wayne-related merchandise and select items for gifts or souvenirs of their visit. It is located at 205 S. John Wayne Drive. I’m proud to be from Winterset, Iowa, just like John Wayne. Thank you for reading The Winterset Citizen.